It may be the biggest week of the curling calendar within the confines of the Dewar's Centre, but I was reminded today of our sport's roots with this photo of Valentine's day play at Tarland. On Saturday eight clubs (16 teams) from the Deeside Curling Association played a bonspiel on outside ice, competing for the Barclay Harvey Trophy. The cup was won by Bouties Curling Club with Banchory CC second. 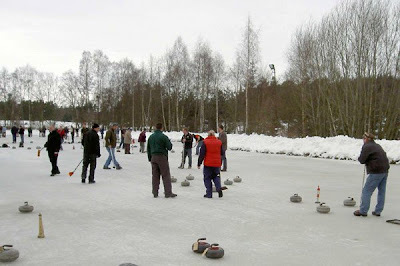 George Rogerson, the Banchory CC President, reports, "The ice was very stiff, so those who had not maintained a keen side on their stones had great difficulty getting anywhere near the head." I don't think those playing in the Bruadar Scottish Men's Championship and the Columba Cream Ladies Championship will have that problem! George says about Tarland, "A very good time was had by all." I hope they do too, at Perth! Many thanks to George Rogerson for the photo above.